As another school year begins, for many parents that presents the challenge of trying to figure out what to pack in their children’s lunch boxes. Even boxes filled with loving care can contain cookies or chips or other easy, unhealthy options. A fun, healthy lunch or after-school snack – including a variety of fruits, vegetables, whole grains and proteins – doesn’t have to be time-consuming, stressful or more costly to put together. Have your child help in planning and packing their meals. When kids are involved, they are more likely to enjoy the foods they select. 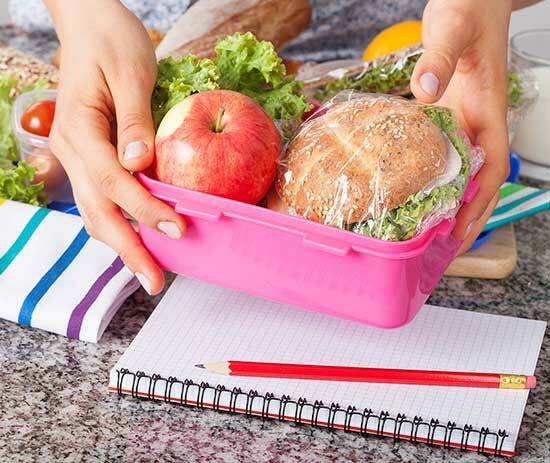 Consider these tips to packing a healthy, tasty lunchbox. Switch to whole grains. While shopping, look for 100-percent whole-grain bread for sandwiches, 100-percent whole-grain tortillas for wraps, and whole-grain crackers. Other examples include quinoa and brown rice. Whole grains have more vitamins, minerals and fiber, and they will keep kids satisfied longer. Pack the protein. Foods with protein may help kids stay full and focused. Make sure each lunch has a good source of protein, such as hard-boiled eggs, beans, nuts, nut butter, tuna, salmon, rotisserie chicken, edamame or yogurt. Skip deli meats like salami and bologna, which are higher in fat, sodium and preservatives. Make it colorful. Adding colorful fruits and vegetables can make a lunch look more appetizing, and these foods are loaded with vitamins, minerals and fiber. Spice up vegetables with a little bit of guacamole, hummus, salsa or low-fat ranch dressing to add flavor and fun. Keep them hydrated. Hydration is particularly important for children, as they have higher water requirements than adults do. Besides water, more fun options include smoothies and low-fat milk. Skip the juice and soda. Add a small, sweet treat. Kids love treats, and adding something small to their lunches gives them something to look forward to. Portion size is key. Aim for less than eight to 10 grams of sugar per serving. Examples include chocolates that are at least 70-percent pure cocoa chocolate and natural fruit smoothies with plain Greek yogurt and almond milk. Minimize junk food. Foods like chips, fruit snacks and candy have little nutritional value. Replace these foods with items like cheese, whole-grain crackers and plain popcorn sprinkled with Parmesan cheese. A healthy lunch can be a great way to fuel your child’s body and mind for the remainder of the school day, but – for a busy family – preparing lunches also needs to be fast, effortless and affordable. One great way to save time during the week is to prep lunch and after-school snack foods over the weekend. Buy, cut and portion out fruits and vegetables so they’re ready to go. Shred chicken, cook hard-boiled eggs, or use leftovers that don’t take much preparation. Pre-package foods like crackers, cheese cubes or trail mix into baggies or containers that can quickly be added to a lunch bag. Get the school year started off right with a healthy, easy lunch and after-school snack routine that is both parent – and kid – approved.